DC could top 60° later this week -- but more flooding is possible Thursday night. Overnight: A few clouds. Low 38. Thursday: Mostly cloudy, breezy & cool with rain and showers. High: 50. Friday: Mostly cloudy, breezy & milder with rain, showers and T-storms. High: 64. Not as cold overnight under partly cloudy skies with lows in the 30s. The Thursday morning commute will be dry but prepare for a slow and wet commute home. We are looking at over an inch of rain by Friday afternoon. 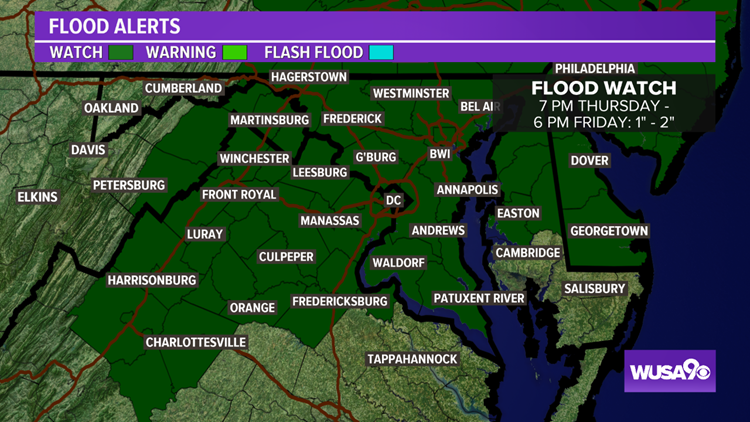 The ground is saturated and with the threat of heavy rain a Flood Watch cover the Metro Area Thursday night - Friday evening. Winds too, could be a factor. Winds could gust over 30 mph Thursday night. Periods of rain return starting around noon Thursday with heavy rain overnight Thursday. Click here to learn more about the rain on the way. Thursday: Mostly cloudy, breezy & cool with mainly PM rain and showers. Highs: 48 - 53. Winds: E 10 - 15. Friday: Mostly cloudy, windy & milder with rain, showers and T-storms. Highs: 59 - 64. Winds: SE 10 - 20. 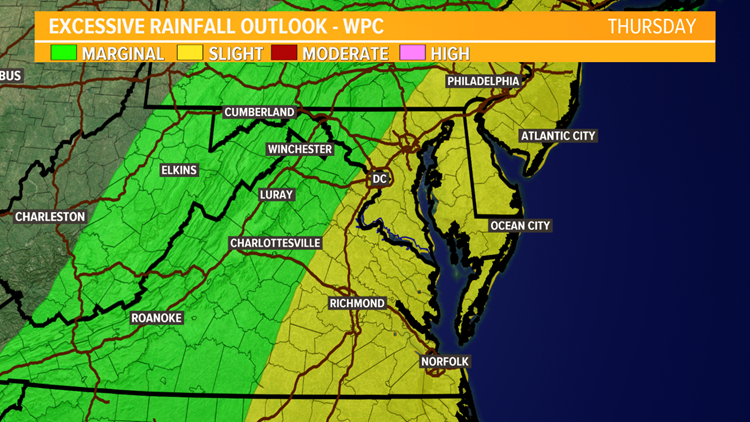 A wet pattern returns to finish the work week as a big low pressure system tracks into the Mid-Atlantic. This will bring showers/rain to the area starting around noon Thursday, lasting through Friday. 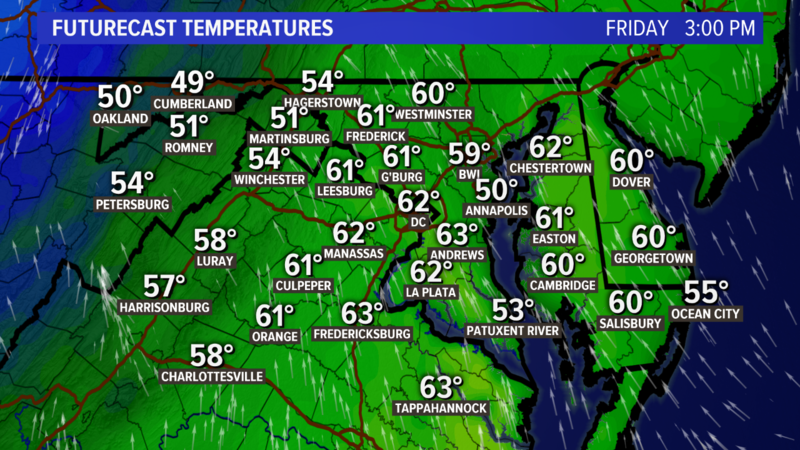 Friday turns unseasonably warm with highs in the 60s! App users click here. Click here to learn more about the timing of rain/showers/t-storms. The winter solstice is on Friday at 5:23 PM. Christmas is just around the corner as well! Click here to see DC's odds of a white Christmas. Friday: Cloudy, windy and warmer with rain, showers & t-storms. Highs: 59 - 64. Sunday: Partly cloudy and chilly. Highs: 48 - 53.